“Joudour Sahara” will focus on empowering youth with a music and arts education programming in a safe and welcoming space. In addition to classroom instruction, the school will offer a visiting artist exchange, indoor and outdoor performance spaces for local and travelling acts, an on-site workshop for musical instrument creation and repair, and accommodations for those who are interested in supporting the school while on holiday. The project is music-centric but has a heavy environmental awareness and conservation component, because it is a learning institution, and creating awareness about the environment issues is also very important. Please visit Joudour Sahara for more information. Local NGO Zaila: has been pioneering environmental and cultural projects since 2005 and created the Taragalte Festival in 2009. Through music, art, workshops, exhibitions, and conferences, the festival promotes and provides a platform for the sustainable development of the region. Aziza Chaouni Projects: Aziza’s Ghaouni’s expertise in the integration of architecture, landscape and green technologies in arid climates. She will be responsible for the construction and layout of the school site and structures. 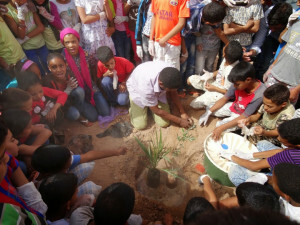 Sahara-Roots Foundation will be responsible for planting trees on the premises of the school and helping to educate about the fragile desert environment. The “Green Gateway to the Sahara” opens it’s gates to “Joudour Sahara”! The Earth Day Activities on the 23rd of April 2016 were dedicated to connecting with the local people of the village Zaouia close to M’hamid Al Ghizlane. A visit was made to a site close to the village Zaouia on which we will start planting trees during the Taragalte Festival in October 2016. During this visit, we had the opportunity to speak with the village elders of Zaouia as we wanted to explain this new project, which will be based on the knowledge of “Permaculture” to them, and to see if they still had knowledge on how planting was done before the arrival of modern techniques such as chemical fertilizers. The “Green Gateway to the Sahara” will open it’s gates to “Joudour Sahara” bringing children and visitors through the “gardens” to the music school. Together with all our Joudour Sahara Partners we would like to help bring back ancient knowledge on how to farm in the oasis as it was done before, without the use of chemical fertilizers. We want to combine the ancient and modern techniques, such as the use of the Waterboxx. With this new project we want to create awareness on the importance of fighting desertification for the local people living on the frontier of the huge Sahara desert. It is important to save the agricultural land and the cultural heritage of this environment. The Green Gateway to the Sahara will serve as a model to show the positive effects of adopting a combination of a Permaculture system, innovative agricultural techniques, and strategically planting trees. With this model we want to show others with frontier plots of land, how to adopt similar systems thus creating a “Grassroots” approach. A Permaculture System for agriculture. We have been researching this system for the past 6 months together with our Dutch Permaculture partner Roos Beute. It is a sustainable approach to farming and planting that rules out the use of chemical fertilizers and mechanical systems that do more harm than good. This system has been proven to rehabilitate formerly arable land for example in Jordan.